When you think of diversity of life, how can the peacock not come to mind. Its stunning to see a peacock strutting around with its feathers fanned out to impress the peahens. 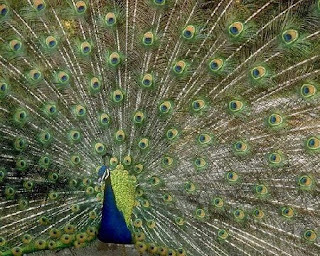 Peacocks feathers grow longer and brighter as they age, until the age of six. Although it takes a little more than showing off your feathers when attracting a mate. Every year, during mating season, a peacock tends to return to the same location to preform his mating ritual. Don't get me wrong, The more colorful and pretty a peacocks feathers are provides major incentive to the peahens. But when the peahen approaches her selected peacock, it happens a little like this. When a peahen comes close enough, the peacock turns his back and brings his feathers up, so the peahen cannot see his colors, and displays his tail feathers and flutters them very quickly. If the peahen is facing him properly, then all she should see is the grey and brown tailfeathers. The peacock continues to take a few steps in any direction, but makes sure the peahen is still directly behind him. As she moves in closer, because of some strange interest in his strange dance, the peacock moves backwards towards her. When she avoids him he reveals his front to her in all his colorful glory, then drops his fan of feathers onto the peahen. Three things could happen: She mates with the peackock after witnessing this crazyness, Walks away and looks for another mate, or just stands still. If she stands still he will start the whole thing over again. or if mating occured the peahen can be expected to lay three to five eggs and raise them with no help from the peackock.